The lowdown: Few wines have become as polarizing as sherry. There are the sommeliers reinventing sherry for their upscale Michelin awarded restaurants, and people who view it with disdain–a drink for old, stodgy British people to enjoy in their elitist home libraries. Most people’s interaction with the wine falls somewhere in the “Grandma at Christmas” experience: a wine drunk by an old person that’s weird and enjoyed only once a year. Sherry is a fortified wine made of grapes. It comes from the oldest wine-producing region in Spain, the Jerez De La Frontera. Interestingly, the name “sherry” even comes from an English corruption of the pronunciation of the wine’s home region. Jerez, pronounced he-reth, quickly became “sherry” through the less nimble tongues of English drinkers. Sherry wines are the result of 3,000 years of Spanish culture. The earliest origins of Sherry dates back to the Phoenicians in 1100 B.C. The Phoenicians were a nation of traders based in modern day Lebanon who are believed to have brought the very first wine presses to Spain, where they founded a city called Xera, now called Jerez. Over centuries, Greeks, Carthaginians, and Romans occupied the region. The Roman shipped sherry wines across their vast Empire at the height of their reign. Even during the five centuries of Moorish rule, when alcohol was prohibited, the Jerez region continued to make wine, and was allowed to do so because the wine was seen as medicinal. Sherry made the trip across the Atlantic on Columbus’ second voyage and was a favorite drink of Shakespeare and many English and Spanish royals during the 17th and 18th centuries. The most direct way to view sherry is as a regional white wine. Despite having a range in taste, dryness, and color, the one commonality is all true sherry grapes are produced and vinified in the Jerez region in southern Spain, and its three central towns: Jerez De La Frontera (the largest sherry producing town), El Puerto De Santa Maria, and Sanlucar De Barrameda. The taste: Sherries fall into a wide range of taste. Some are incredibly dry and others syurpy sweet. At its most basic, sherries are categorized based on whether they have aged under flor or not. The flor is the layer of yeast that grows inside a cask of sherry and protects the wine beneath it from over-oxidizing. Wines made under flor are dry and clear. Wines made without are darker in color and in flavor. 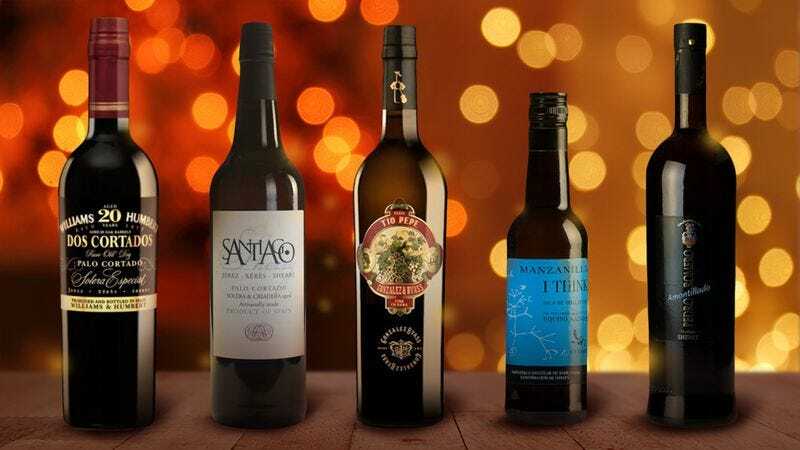 Under the flor are wines such as Fino and Manzanilla, the driest and palest of the sherries you might order, and amontillado, a amber-colored wine with a more herbaceous and nutty taste. Sherries without flor include the Oloroso, which is a deep amber color and on the higher end of nuttiness. There are also sherries that are “liquored” to make them sweeter and dessert wine sherries like Moscatel and Pedro Ximenez, but that’s a whole other animal. If you’re already acclimated to wines with a little more punch, try Equipo Navazos Manzanilla En Rama. Manzanillas are finos produced in the coastal town of Sanlúcar De Barrameda. But because they are even lighter in color than most varieties of fino, manzanillas have a fresh quality and are good to pair with very salty foods. This is the wine to try with seafood. Next steps: Once you’ve checked off dry, crisp finos and manzanillas from your list, consider moving on to more nuanced wines such as the Pedro Romero Amontillado. Amontillados are sherries where the original flor dissolves, allowing the wine to oxidize more than originally intended. Oxidation translates to a darker color, which usually means more flavor complexities in your glass. This is a great sherry to drink with white meats like chicken and pork, or with savory appetizers. It’s a browner sherry with a nuttiness and a rich, borderline-umami flavor. If you’re truly ambitious, the next level up past amontillados are the Palo Cortado. This varietal is an “accident” wine intended to age with flor, but—like the amontillados—the flor dissolves. In a Palo Cortado some kind of wine alchemy occurs though, causing the wine to become even richer and more complex. We recommend snagging a bottle of Aecovi NV Santiago Palo Cortado—here’s one of the few instances we suggest drinking it without food. It’s a wine with hints of vanilla cream and orange marmalade, with a nutty taste on the start, but a finish of a well-rounded, gorgeous toffee flavor. Talk like an expert: Sherries are aged in a unique system called the solera, where barrels of fortified wine sits for years and years at whatever the air’s temperature is. Wine is removed from the oldest barrels for bottling, and more is added to the barrel to keep the solera going. The easiest way to sound like an expert is to talk about the “later editions” of a sherry. The later the editions, the more unrefined and complex the wine becomes.